Creators of the Cartoon Network series SECRET SATURDAYS used TALES OF THE CRYPTIDS as their first research guide. They even featured my friend and cryptid illustrator Rick Spears on this promotional video. So COOL!! The authors of this Junior Library Guild selection have all been interested in the mysterious and the imagination since their childhood. They all remember strange creatures that lurked in the "gloom of night" that both frightened and intrigued them. As Young says, "Our stories are sacred things. They define us as human beings and teach us how we're supposed to fit into the world. But sometimes we find pieces that don't quite fit, and that's when things get really, really interesting." 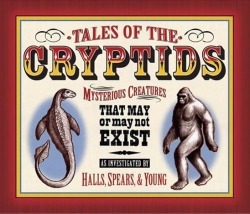 This book provides the history behind the study of cryptids, or the study of "animals that may or may not be real." The authors provide both supported and unsupported tales, including information about these unusual animals based on scientific facts, pictures, and tales or stories of sightings. 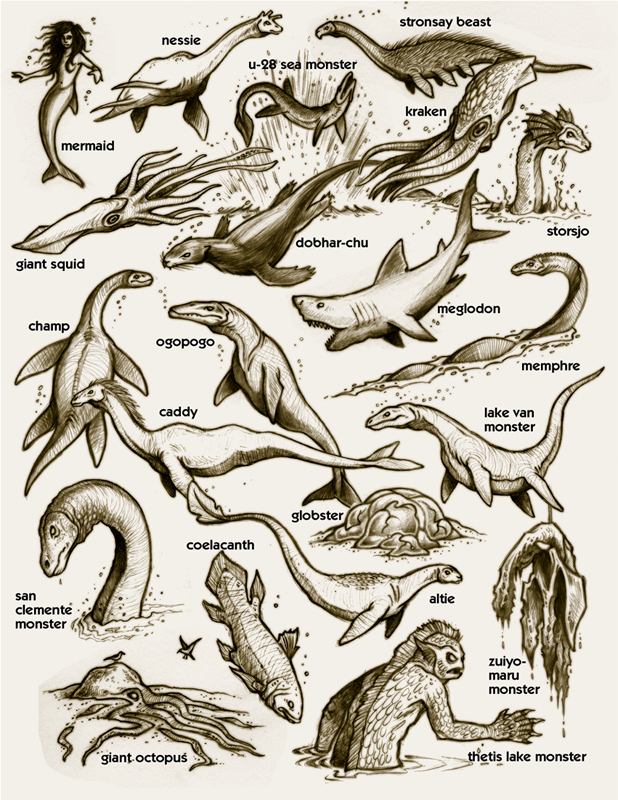 Discussion of the more famous cryptids include: Bigfoot (Yeti, Swamp Ape, Sasquatch, etc); the Loch Ness Monster and other sea serpents; the Mokele-mbembe (and other dinosaur- like animals); cryptic mammals like the Amazonian Mapinguari, the North American hyena, and the Goat Sucker or Chupacabras. The "Cryptid Close-Up" provides the name, other names, sighting locations, length, weight, and physical characteristics. 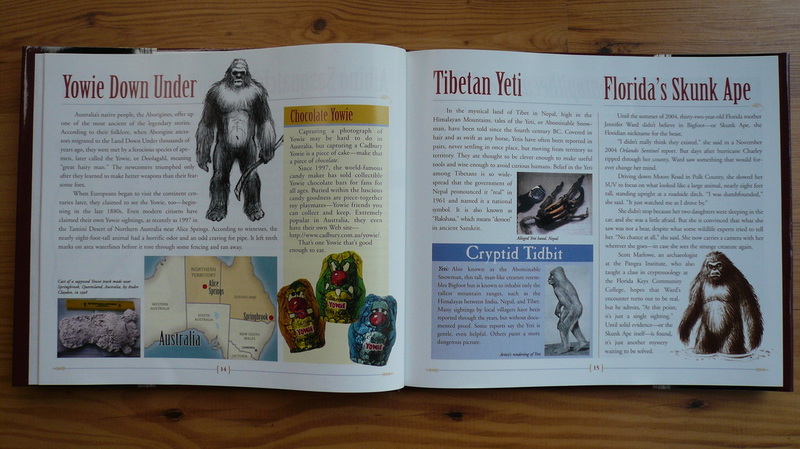 Illustrations and pictures of a cryptid, as well as drawings or pictures of actual animals, are included to give the reader an idea of how a cryptid may look. Map inserts show where these animals have been sighted. Readers will enjoy the "Imagine…" introductions to the different types of cryptids that paint a picture of how it might feel to hear or see one of these strange creatures. They will also appreciate the well written descriptions and history of the various animals that are or may be supportedby expert testimonies and scientific discovery. 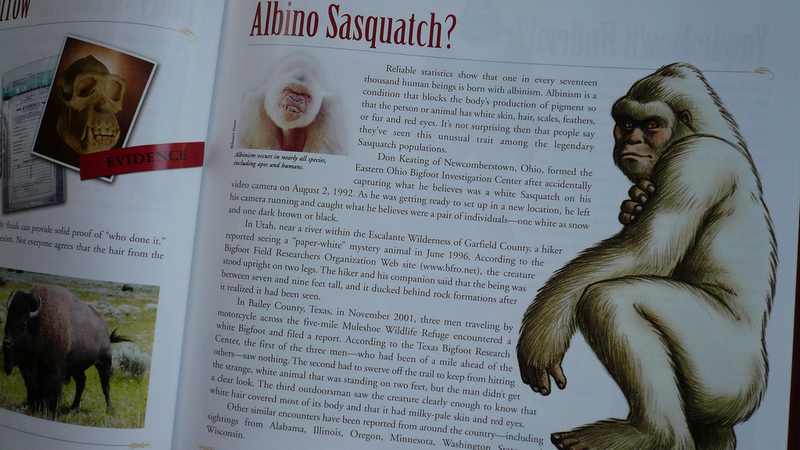 The authors also point out that in many instances no proof exists to support the theories of some cryptids. The "Cryptodictionary," a listing of the "mysterious creatures that may or may not exist," includes a reality index that labels verified animals with five bullets, while those with one bullet are a verified hoax. Those in between are animals about whom stories have been told but may never have been sighted or had numerous sightings and have no scientific verification. A bibliography of books, articles, interviews, and web sites will provide the interested reader with a wealth of information on this topic. Yeti, Yowie, or Sasquatch-the elusive North American ape called by any other name probably smells as . . . gamey? The authors indulge their fascination with legendary animals in this fact-packed, highly visual volume about Bigfoot, Nessie, Chupacabras, and Mokele. Well organized into four categories, each section begins with a shiver-inducing "Imagine . . ." that segues into a second-person point of view premise that an iconic cryptid is real. Each creature gets a quick fact box that covers names, sightings, height, weight, and characteristics. Notable scientists share their observations and research, and the journalistic-style interviews with credible experts provide depth and authority. Maps abound. The images are plentiful and run the gamut of artist's models and renditions to photographs. The preface states that the authors hope readers approach the book with a healthy dose of skepticism. Hoaxes are prevalent, but refutes of faked evidence are also provided, and they are quick to point when authenticity is dubious, balancing the coelacanth (once thought extinct before live specimens were discovered) with the feejee mermaid (a ruse perpetrated by P. T. Barnum in the mid-1800s). A "Reality Index" at the end of the book weighs all the data-or lack thereof-to verify and debunk each cryptid discussed. Regional differences of similarly evolved beasts, historical accounts, scientific principles, and excellent storytelling make this account a cross-curriculum title. Nearly every article cited is available free online. It is a fascinating book to browse or devour in one sitting. Gr 4-7-Most kids love monsters, and Halls, Spears, and Young obviously had a grand time pulling up creepy critters to feed readers' fertile imaginations. From old big leaguers like Bigfoot and his kin, and Nessie and her ilk, they pop down to the minors with Mokele-mbembe and Olitu, and on into the bush leagues with the Bunyip and the Caddy. To spice up the roster, the authors provide "found" information on former cryptids such as the coelacanth and the Chacoan peccary, and data on pure hoaxes like the Piltdown Man and the Cardiff Giant. Pure scientists will bridle at cryptozoology passing itself off as anything but a pseudoscience, but readers will scramble to find data on such eerie apparitions as the Chupacabra and the Mongolian Death Worm. The conversational text makes for fun reading, and a plethora of pictures (photos and drawings in both color and black and white) will prove enticing. A cryptidictionary provides a full roster of "mysterious creatures that may or may not exist" in tidy alphabetical order, complete with a "reality index" rating for each one. For a personal reality check after all this engaging hoopla, try Sally M. Walker's super Fossil Fish Found Alive (Carolrhoda, 2002), Richard Ellis's readable The Search for the Giant Squid (Lyons, 1998), and Kathy Darling's exciting Komodo Dragon on Location (Lothrop, 1997), or, for a truly icky experience, Christopher Maynard's Micromonsters (DK, 1999), which deals with human parasites (not for the squeamish! ).-Patricia Manning, formerly at Eastchester Public Library, NY Copyright 2006 Reed Business Information. ...was a great cartoon show about chasing cryptids. They used TALES OF THE CRYPTIDS as a research guide and featured Rick Spears in their national promo in theaters across the country. Pretty great. If you look closely when Rick si talking here, you'll see the book just behind him.